The black uakari weighs a little less than 3 kg (6.6 lb) and has a head and body length less than 0.5 m (1.6'). There are two subspecies of black uakari. The golden-backed subspecies (Cacajao melanocephalus ouakari) is richly colored with a saddle and back of golden-yellow that contrasts with its darker chestnut-red sides and underparts. Its arms are dark-brown or blackish as are the lower parts of its legs from the knee down. The flanks are chestnut red, this extending to the short tail as well. The black-backed subspecies (C. m. melanocephalus) has none of the golden-yellow on its back, being primarily blackish from the head to the mid-back and reddish brown or tawny at mid-back, not contrasting with the lower back or thighs. The black uakari seems to prefer habitat along small to medium-sized black water streams and lakes, including black water seasonally flooded forests (igapo) and the inland unflooded ("terra firme") forests adjoining such igapo. The majority of its diet is made up of immature seeds. It also eats fruit pulp, leaves and arthropods. The black uakari is arboreal and diurnal. It forages at all levels from the surface of the water in a flooded forest up to the canopy and also descends to the ground to consume seedlings. Groups consist of multiple adult males and females, juveniles, and infants. Large groups of more than 100 black uakaris, some perhaps approaching 200 animals, have been seen. But these large groups result from the temporary fusion of several smaller groups. More long-lasting groups consist of 20 - 70 animals. Black uakaris are very social. Members of a group groom each other frequently. Males are very tolerant of infants, which they carefully guard from danger. 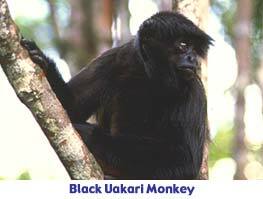 The black uakari occurs in the upper Amazon Basin north of the Amazon River in southeastern Colombia, southern Venezuela, and adjacent Brazil. In some areas, such as parts of Colombia, hunting is a threat. *** Uakaris are the only monkeys in the Western Hemisphere with a very short tail, less than 1/3 of the head and body length. This is unusual for an arboreal animal. 2004: Occurs in Brazil, Colombia and Venezuela (Defler 2004). In some areas, such as parts of Colombia, hunting is a threat. There is a birth season around March - April on the lower Apaporis River of Colombia, with some births apparently occurring outside of this season (Defler 2004) . The black uakari is arboreal and diurnal. It forages at all levels from the surface of the water in a flooded forest upwards to the canopy and also descends to the ground to consume seedlings. In one study in Brazil, it was estimated that the daily activity pattern of the black uakari included 22 % rest, 27 % travel, 20 % feeding and 31 % foraging. The black uakari is predominantly quadrupedal - walking, running and leaping with great frequency. Its leaps across gaps between branches are spectacular and cat-like and some cover vertical spaces of 5 - 10 m (16 - 33') and horizontal space of up to 5 m (16'). The black uakari has been seen to sleep in exposed positions over the flooded forest, sometimes only 10 - 15 m (33 - 49‘) over the water on a sturdy branch. In unflooded areas it sleeps much higher up and less exposed at 25 - 30 m (82 - 98') above the ground. Black uakari groups consisting of 20 - 70 animals have home ranges of 500 - 1000 hectares (1250 - 2500 acres) (Defler 2004) .